The Australian Shepherd was actually developed in America, but there are many debates over the origins of the foundation stock. It is believed dogs travelled over with flocks of Merino sheep and the Basque shepherds who tended them. Some contend they came to Australia from Spain when the first Merino sheep arrived, and then travelled on to America. Others believe they were Australian Sheepdogs derived from the Smithfield and some type of Collie – possibly the German Coolie or its ancestor. The name came about because of the perceived link with this country and the herding of Australian Merino sheep. In Australia the breed is in its infancy, only having been introduced in 1990. Australian Shepherds were fully recognised by the Australian National Kennel Council on 1st January, 1994. Since then, the dog has gained considerably in popularity, competing successfully in conformation, obedience and agility. 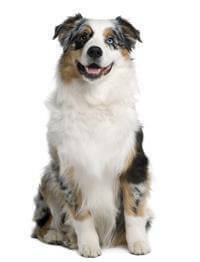 The Australian Shepherd generally lives up to 13 years of age and with the proper care and fed the correct amounts of nutrition can often live up to 15 years of age. A male in peak condition should weigh up to 30kg and be about 60cm tall while the female is normally 22kg and 47cm tall. The Australian Shepherd is good-natured with an even disposition. It may be somewhat reserved when meeting people for the first time, but there should never be any display of shyness or aggression. This breed is primarily a working dog with strong herding and guarding instincts. It is very agile and works with style and enthusiasm. Although not couch potatoes, some are quite content to be lap dogs. Extremely intelligent and devoted to their families, they are quick to learn and very easy to train. Reserved, but good with animals they grow up with. A huge yard is not required for this breed, but daily exercise is a must. ‘Grinning’ is a characteristic of some Australian Shepherds and is not to be mistaken for snarling. The Australian Shepherd is perfect for the person wanting a highly trainable dog. If you have the time and commitment to take on an Aussie Shepherd, you won’t be disappointed.